Do you want some extra help kickstarting your weight loss program, but you want to avoid the jitters, insomnia and irritability of harsh stimulant fat-burners? 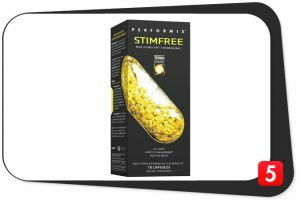 Let’s review five of the best stimulant-free fat burners that can help you burn calories and achieve your weight loss goals without all the stim-related side effects. Click here to jump down the page to our analysis of why these stimulant-free fat burners are Best 5, along with details on buying (and deals). 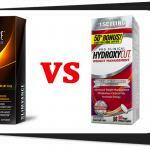 Or, read on to learn about the best stimulant-free fat burners. 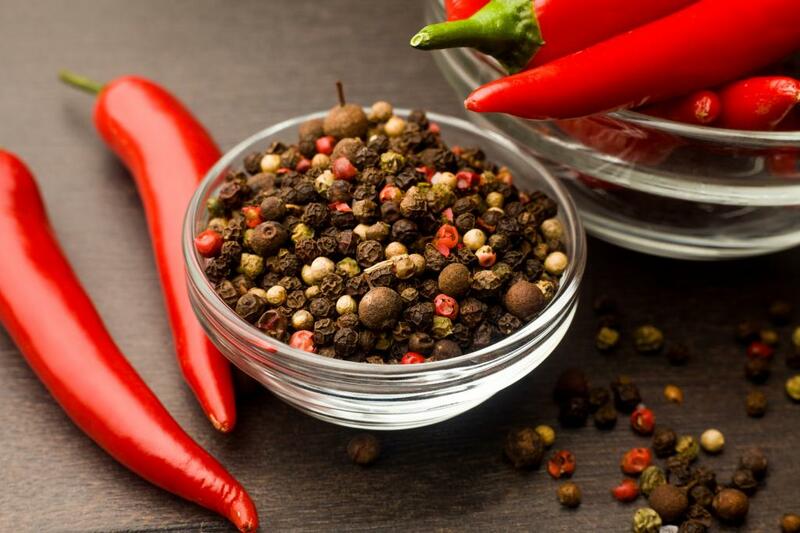 Cayenne and black pepper extracts are examples of effective non-stimulant fat burner ingredients. 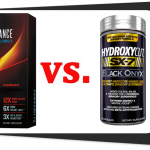 Both are among our top-rated fat burning compounds overall. Thermogenics, or fat-burning supplements are a healthy complement to any diet and exercise program. Some thermogenics contain high-octane stimulants, which can interfere with sleep. Lucky for you, there are several highly potent fat burners that are also free of stimulants. The best thermogenic supplements should be a mix of the most effective and proven weight loss ingredients into one convenient capsule or powder. You’re anxious to find the ideal supplement that will skyrocket your fat-burning results. But first, let’s break down the reasons why you might want to avoid a stimulant-based fat burner in the first place. 1. You have anxiety: One of the most common side effects of a stimulant-based fat burner is anxiety. If you’re already struggling with anxiety or a mood disorder, stimulants can make it a lot worse. 2. Sensitive stomach: Stimulants such as yohimbine and caffeine have been shown to trigger nausea, especially when taken on an empty stomach. 3. Blood pressure concerns: On every stimulant-based supplement bottle, you’ll find an explicit warning about taking stimulants if you have blood pressureissues. Stimulants can raise your blood pressure to unsafe levels while making it difficult for them to come back down. 4. You won’t sleep: There’s a reason experts say not to drink coffee after four in the afternoon: It can keep you up at night. Stimulant-based fat burners present the same problem; however, they may be worse due to excessively high stimulant dosages. 5. Addiction concerns: Dedicated coffee drinkers who suddenly stop for health or dietary reasons often complain of caffeine withdrawal. Consistent reliance on stimulant-based fat burners can quickly lead to addiction where your body will need the supplement just to function on a normal level. 6. You can burn out: While there is some debate on the science behind adrenal fatigue, many experts agree that overuse and abuse of stimulants can contribute to the condition. Overtaxing your adrenal system can result in extreme fatigue, confusion, and irritability. 7. Jitters: Stimulant-driven fat burners can make you agitated, jittery, shaky, nervous… you know the score. What Ingredients Should People look for in a Stimulant-Free Fat Burner? Not all stimulant-free fat burners are created the same. There are plenty of hyped-up ingredients that do little more than drain your wallet. Let’s take a look at the best stimulant-free fat burning ingredients to maximize your results of weight loss and shredding. The same spice that gives your favorite dishes a kick also contains a unique extract that can support fat loss. Within cayenne pepper extract, you’ll find Capsaicin, the source of the pepper’s spice and health benefits. Finally, Capsaicin has been shown in several studies to directly support fat loss. One study published in called Capsaicin the “anti-obesity drug,” citing it to be most effective when taken an hour before a workout. Capsaicin has also been shown to be effective at alleviating pain, making it an effective part of your post-workout recovery. In tropical regions such as Nepal and Thailand, you’ll find Coleus Forskohlii, a member of the mint family. Inside this plant, there is a unique compound that has been getting a lot of attention in the natural weight loss community called Forskolin. Forskolin is a stim-free ingredient that has a unique effect on a chemical messenger in the body called cyclic adenosine monophosphate. cAMP is responsible for promoting the release of stored fat, increasing your metabolic rate, and signaling for the creation of energy via fat. Forskohlii has been shown to increase the levels of cAMP in the body, which may help to promote fat loss. One study showed that subjects supplementing with Forskohlii lost an average of nine pounds while improving their hormone levels and bone mineral density. Forslean® is the best form of the stim-free Coleus Forskohlii as it has the scientific studies to safely back it up. It is standardized to 20% Forskolin. Short for beta-Hydroxy beta-Methylbutyrate, HMB is derived from the popular amino acid, leucine. As one of the essential branched chain amino acids, leucine gets a lot of attention as a form of muscle building support and, perhaps more importantly, as an anti-catabolic agent. Catabolism is when your body begins to break down muscle protein for fuel. The two most common scenarios when your body starts to break down muscle as fuel? During fasting and fat loss; both of which go hand in hand. Regardless of whether your goal is muscle building or fat loss, you don’t want your body eating muscle protein, only fat. This is where HMB can help without stimulants. HMB does not directly boost your metabolic rate, nor does it eat away at fat; however, it does encourage the body to preferentially burn fat as fuel. 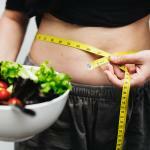 HMB has also been shown to protect muscle from breakdown during low-calorie dieting and fasting. Since HMB keeps muscle tissue off-limits as a fuel source, the body will jump to stored fat as fuel. HMB is an ideal supplement for any kind of fat burner that is used in conjunction with intermittent fasting or fasted training. It helps to block muscle atrophy during fasting while maximizing fat loss. Conjugated Linoleic Acid, more commonly known as CLA, is a jitter-free omega fatty acid compound. Seems odd, right? Fat being used to burn more fat. CLA plays an important role in several bodily processes centering around energy metabolism, food consumption, and fat utilization. Studies show that CLA supplementation can reduce the amount of leptin that is produced in your body. Leptin is a hormone that triggers your appetite. CLA can also enhance your body’s metabolic response, resulting in more calories burned. Most importantly, CLA attacks body fat. Studies show that CLA supplementation can reduce body fat when used in conjunction with a healthy diet and exercise routine. CLA is a fatty acid supplement and fats are notorious for having a rapid oxidative effect. In other words, you want them as fresh and as well-packaged as possible. Always check the date of manufacture and avoid foreign brands. Buy a CLA supplement that provides at least 3,000 mg per serving. Before your morning cup of coffee gets turned into the beverage you know and love, it starts out as just a green bean. Before the roasting process, the green coffee bean still holds high levels of unique compound called chlorogenic acid (CGA). First, green coffee bean extract can promote the release of fatty acids as a fuel source. This isn’t a short term response either; researchers suggest that long term supplementation with GCB will help to continuously trigger the use of stored fat as fuel. Second, the chlorogenic acid found in green coffee bean extract has been shown to support blood sugar balance, which promoted a greater weight loss among the subjects. Green coffee bean extract is available in both a caffeinated and decaffeinated version. While the natural caffeine content is low, it’s best to play it safe and select the decaffeinated version of the supplement. Acetyl L Carnitine has been a famous stimulant-free fat burner for years. It is a step above its predecessor, L-Carnitine, because it’s able to pass through the blood-brain barrier, making it highly bioavailable and effective. Once absorbed into the body, Acetyl L Carnitine gets right to work. Studies show that Acetyl L Carnitine supports fat burning by promoting the use of stored fat as fuel. It also increases work output during exercise. ALCAR is a good ingredient for both stimulant-free fat burners and stimulant-free energy supplements. These two categories can be stacked together for improved weight loss results. Our top-rated stimulant-free energy booster supplement supplies 750 mg ALCAR and stacks especially well with stim-free fat burners — enhancing weight loss by energizing workouts and boosting cells’ mitochondria. Used for thousands of years as a health and wellness aid, studies are finally revealing the power of green tea extract. Aside from acting as a powerful anti-oxidant, helping to rid the body of free radicals, green tea extract is a stim-free proven way to increase your body’s metabolic response. Studies show that supplementation with green tea extract can promote fat loss with none of the side effects associated with strong stimulants. Green Tea Extract is available in both caffeinated and decaffeinated. While the natural caffeine content is low, it’s best to go with decaffeinated to avoid any chance of side effects. We also consider the power of the brand and the overall presence and reputation of the best supplement companies in the market. We only feature manufacturers who support and stand behind their stimulant-free products. 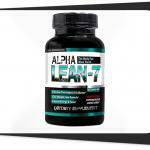 Want a scientifically formulated, clean label fat-burner with no stimulants? 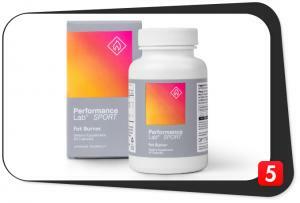 Performance Lab SPORT Fat Burner is the best on the market. This powerful, smartly designed stack is especially effective for those looking for muscle-preserving support while fasting for weight loss. 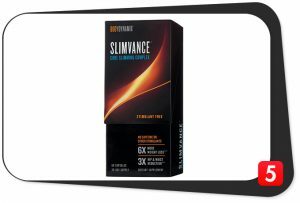 Following up on the success of its stimulant-based counterpart, Slimvance Stimulant Free combines three Ayurvedic herbs into a clinically-tested fat burning supplement. That’s right, this fat burner has been put through the lab in two human clinical trials, demonstrating benefits for weight loss and reducing inches in problem areas. Clean Label: No. Titanium Dioxide (Mineral Whitener) and artificial colors (FD&C Red #3, FD&C Yellow #6). Advanced Delivery: No. Not vegan-friendly. Stimulant Free: Yes. All natural, stim-free formula. Any Deals? Yes. Buy 1, get 50% off a second bottle (might be a limited time offer). Service: Since it is sold at GNC, you get GNC customer support. 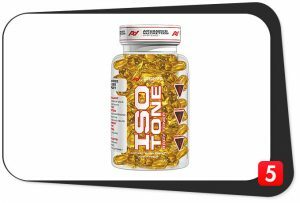 This fat-based, stim-free fat burner takes research-backed forms of fatty acids and perfectly blends them in one super effective weight loss supplement. It is mostly driven by CLA, which is an evidence-backed fat burner made from safflower extract. CLA is one of the best research-backed fat burners to work without stimulation. Clean Label: Yes. No additives outside of gelatin. Stimulant Free: Yes. Fat-based fat burning. Any Deals? No. Main website has no deals, but third-party retailers may offer a deal. Armed with Terra Bead technology, this stim-free fat burner provides an impressive line-up of some of the most studied and used thermogenics including Phytosome® Green Tea and Capsimax®. It takes a couple of different routes to fat burning, like 5-HTP for mood-related appetite control, and Uva Ursi and Dandelion for losing water weight. Clean Label: No. Microcrystalline Cellulose, Ethylcellulose, Hypromellose, Magnesium Stearate, Talc, Xylitol, Medium Chain Triglycerides, FD&C Yellow #5 Aluminum Lake, Titanium Dioxide, Stearic Acid, Sodium Alginate. Advanced Delivery: No. Not vegan-friendly; contains soy. 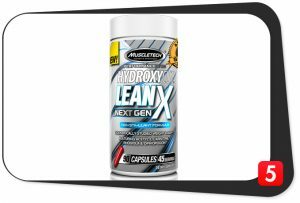 Muscle Tech has been cranking out best-selling supplements for over a decade and Hydroxycut Lean X Next Gen is no exception. Featuring some alternative yet effective thermogenics (without stimulants), this fat-burner will help you achieve your weight loss goals by using a combination of stim-free ingredients for thermogenics, energy, stress resistance and more. Also includes Lion’s Mane, a nootropic for mental balance while dieting. Full ingredient list: Acetyl-L-Carnitine Hcl 500 mg, Choline bitartrate 100 mg, Dill extract 50 mg, Lion’s Mane 50 mg, Bioperine® Black pepper extract 5 mg, Weight Loss Plus Complex C. Canephora Robusta Extract (green coffee) (bean) (45% chlorogenic acids) 200 mg, Rhodiola rosea (3% rosavins, 1% salidrosides) 50 mg, Ophiopogon extract polysaccharides 50 mg, Cayenne Pepper 5 mg.
Clean Label: No. Titanium Dioxide, FD&C Red No. 40, FD&C Blue No. 1), Magnesium Stearate, Silicon Dioxide. Service: Sold via Bodybuilding.com – Up to 6 month return policy – Refund in cash for unopened items or store credit for opened items. Despite popular belief, effective fat-burning supplements don’t need to be packed with stimulants to help women and men to lose pounds. For those with certain medical conditions or a sensitivity to stimulants, caffeine-based fat burners can do more harm than good. Lucky for you, there are proven stim-free fat burning supplements that can promote an enhanced metabolic response, setting up your body to incinerate fat without the jitters or risks of stimulants. The five stimulant-free fat burners listed above contain the perfect line-up of thermogenic ingredients without cheap fillers or unproven results. Enjoy the fat burning edge without worrying about stim side effects — any one of these stacks is a strong choice for stim-free fat loss.